It's three weeks into the school year when music junkie Casey Barnes gets a second chance with her mysterious, heartbreaking ex-boyfriend. She comes up with a plan to win him back, but it soon spins out of control as rivalries, revelations about him, and music itself all start to collide. For Casey the newfound attention means learning the difference between wanting center stage and actually being on it. Okay, I'll admit I'm a person who will think you're just a tad bit more cooler if you have awesome musical taste or if you introduce me to something new musically. Having said this, I adore Casey Barnes for this very reason. She was able to do a bit of both! She isn't your usual teenage character. She's definitely reckless and a bit naive at times, but I also think she has a lot of characteristics that are really admirable for someone her age. Without giving too much away, she has her mind set on things that are more important. Her future in music being one of them. I don't even know how I'd really explain this book to someone, but if I had to come up with a description I want to say it's like if Gilmore Girls and Juno decided to come together and somehow have a baby with Glee, this book would be it. One of the many things I loved about this book was the writing style. It completely fits with the way that Casey Barnes acts. I truly felt like I was in her head at all times. Even though this book was fairly short, E.A. Rigg was able to give almost every character that was introduced their own personality and storyline without it feeling underdeveloped. The book is full of fun characters you'll love and hate, all while you're bopping your head to really obscure music you're likely to not be familiar with. 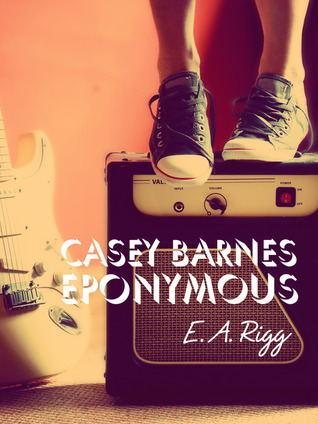 If you're looking for a musical treasure trove wrapped up in a witty package, Casey Barnes is definitely the girl for you. High five to the author for providing me a copy for review. Even MORE epic high fives for having two eBook copies to giveaway to you guys! All you gotta do is fill out the form below! This contest will end on Sunday, May 20 at 11:59 p.m. Keep a look out for the Casey Barnes character interview and playlist next week!